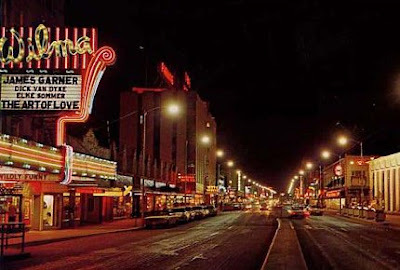 Weren't those neon signs the greatest? The Wilma is so elaborate and elegant in this picture. There's just something sort of magical in them, in the town dark. Miles City still has a couple neon signs, my favorite being the Bison. Why, do you suppose, did they fall out of vogue?I'd love it if they made a big comeback! The current marquee at the Wilma is supposedly a partial replica of an older marquee there, but it's also got this new electric signboard that just makes it really ugly. For my money, the sign in this picture is the one they should have!